This colander fits into my pressure cooker/canner. When pressure cooking small products like beans or peas in liquid sometimes they bubble up and clog the release vent. This causes the over pressure device to open and makes a mess streaming the contents onto the ceiling. 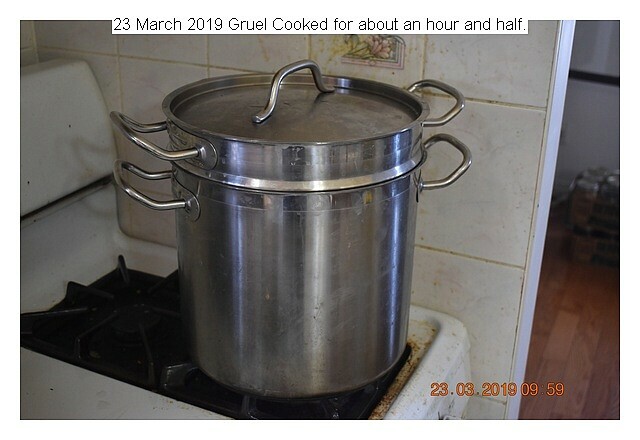 This colander sits just above the water in the cooker and the contents are cooked by steam, in my case usually at 15 PSI. 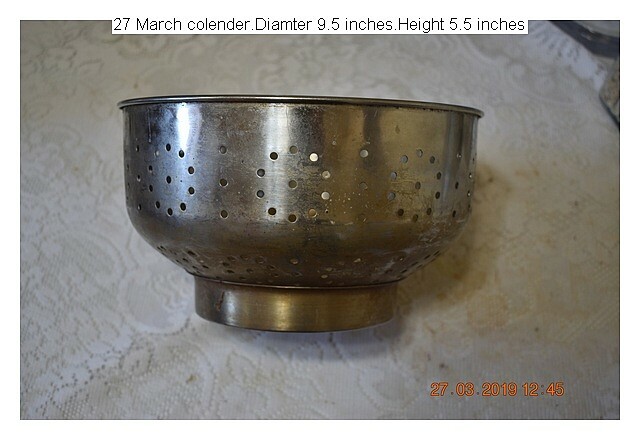 Th colander had two handles spot welded which I broke off so the device would fit into the pressure cooker.Colanders are available in many hardware stores and the internet. 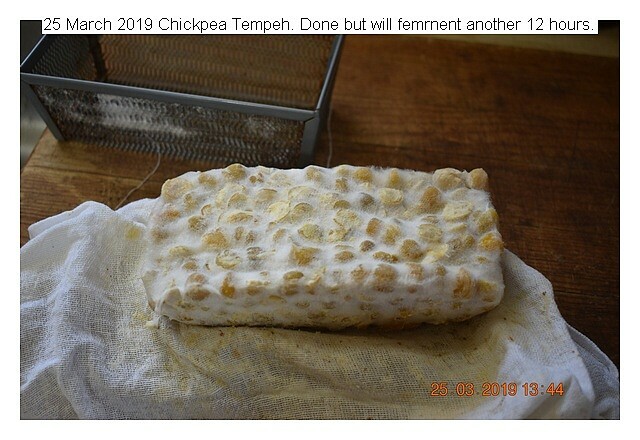 Five hundred ml of chickpeas were made into tempeh. 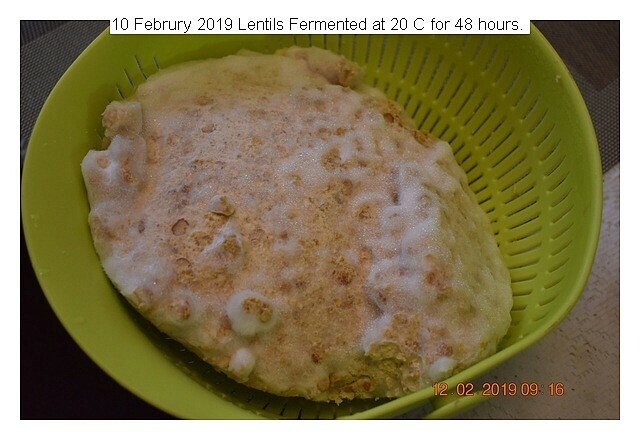 Procedure is wash, boil for 45 minutes, rub with hands about five times to remove the pea skins,Pressure cook for about 40 minutes, cool and add tempeh starter, mix thoroughly, place in cotton covered molds, place in fermenter for 24 to 48 hours, a personal choice. It is usually ready after 24 hours. Pictures depict the process. Six (6) grain gruel, use a bowl for daily breakfast. Sprouted wheat, nixtamalized colored corn, sunflower seeds, flax seeds, and rice. Beat fine with water in the blender. Cooked in double boiler, prevents burning, for 1.5 hours, then stored in sealed plastic containers and frozen. Also half a liter of almonds were added but forgot to take a picture. Tempeh after 30 hours of fermentation. 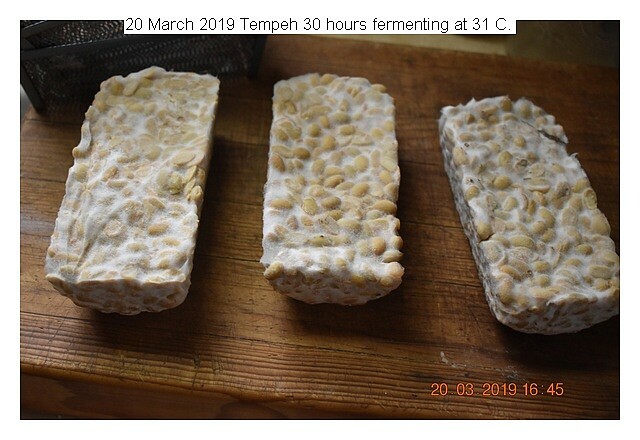 The tempeh was allowed to ferment ten hours more at room temperature. Total fermentation time is 40 hours. 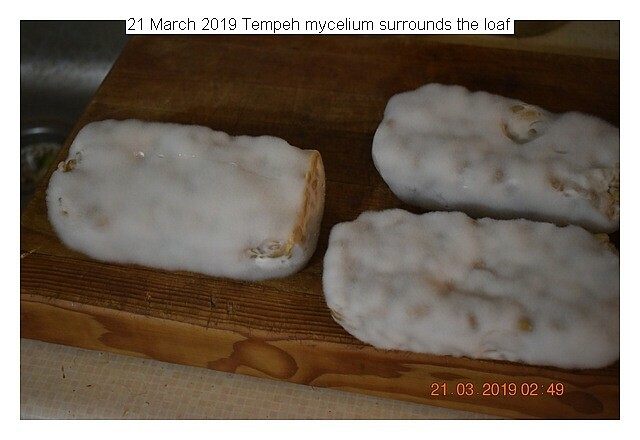 The mycelium completely covers the loaf. I consider this perfect. To stop fermentation the loaf is wrapped in plastic wrap and placed in the refrigerator. 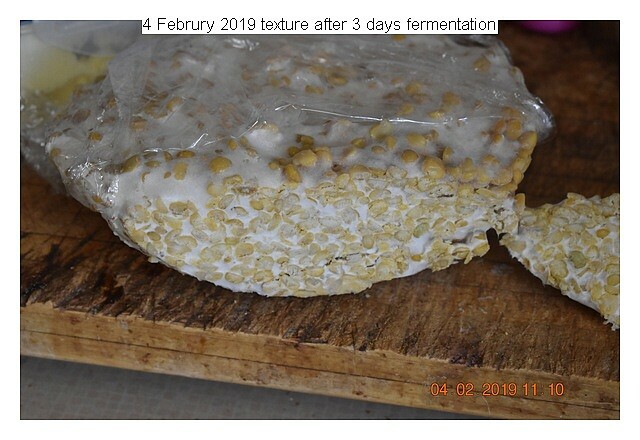 Th cool refrigeration stops further fermentation. 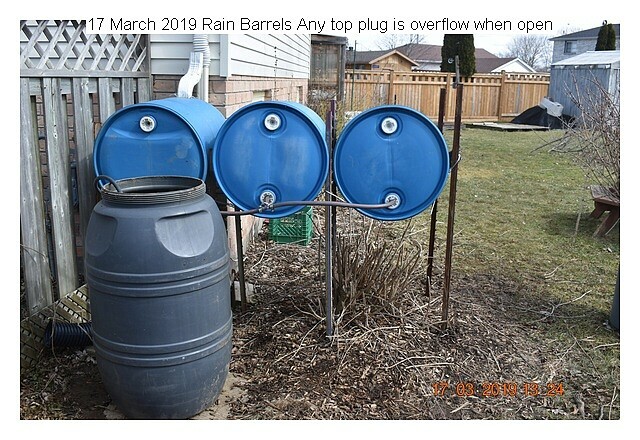 17 March 2019 Rain Barrels. Purchased three 45 gallon sealed barrels for collecting downspout rain water. $20.00 each. Barrels have two bungs one has a pipe thread and the other is a garden hose type. I used the pipe thread. Much difficulty obtaining the fittings from the local hardware stores. Eventually ordered some fitting off the internet. Each barrel on the outlet has an added shut off inline valve. The barrels are placed on two steel cable slings in the horizontal position supported by fence posts about 3 feet off the ground, and are connected together by 1/2 inch garden hose. A dip barrel is used for removing the water, and is transported to the garden area in a wheelbarrow. I had similar but used steel barrels which rusted. The present barrels are thick plastic. There is one connection to the down spout which is a plastic coupler which is removed for winter, since it freezes. Overflow is accomplished by removing the top bung in the intake barrel, water simply gushes out and flows away from the area. 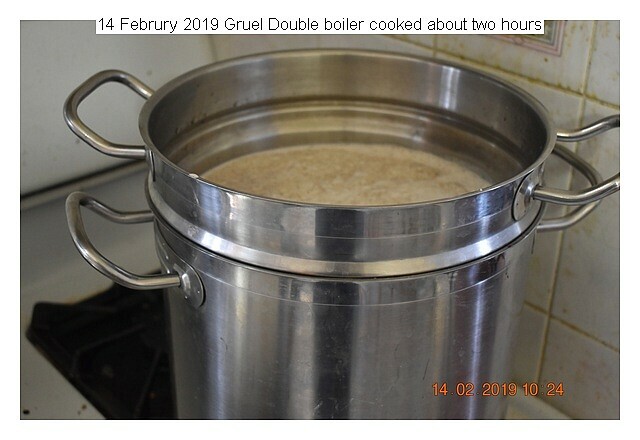 http://durgan.org/March%202019/17%20March%202019%20Rain%20Barrels/HTML/ 17 March 2019 Rain Barrels. Three Barrels were installed to collect down spout rain water. The collected water is run to a dip barrel, and moved to the garden area in a wheel barrel. Each barrel has a on/off valve not received yet. Three barrels of water is sufficient for my garden needs during the summer. Seven bulbs of my stored garlic were processed for daily consumption. Maximum garlic benefits are achieved by ingesting garlic crushed and raw. To make ingesting tolerable I mix the daily plug of garlic with oat milk which effectively inhibits the burning sensation. Processing consists of removing the cloves from the bulb splitting with a table knife. Each clove is crushed with a conventional tortilla press and the skin is lifted off. 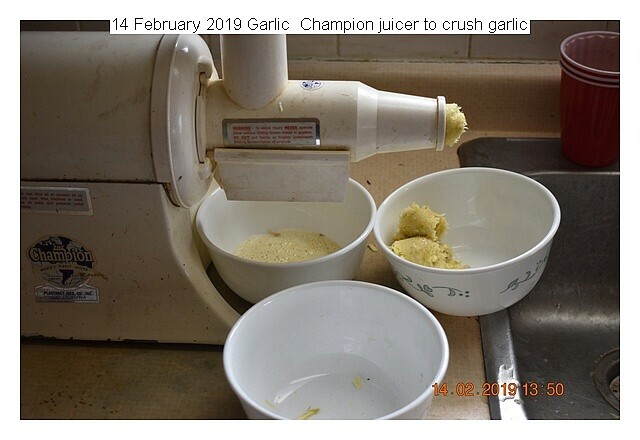 The skinned garlic is then put through a Champion juice to crush. The pulp and juice is then mixed together, placed in a mold for freezing. One plug is ingested daily with my morning drink. Beneficial I don’t really know. Made a batch of gruel, ingredients are; wheat,tempeh, nixtamalized corn,flax, almonds,sunflower seeds. Each ingredient is blended until fine with water. Poured in a double boiler and gently cooked for about two hours. Stored in plastic containers and frozen. A bowl is ingested daily for breakfast mixed with oat milk and often molasses is added.. This amount is about a months supply for one person. Ingredients are from bulk food store. Experimenting with fermenting lentils. These were fermented at room temperature 20C. The lentils need be a bit soft. This batch was cooked in the pressure cooker for about 35 minutes. The starter was mixed and the lentils were placed in a colander. The air holes are necessary. The colander was placed in a large pot and set aside to ferment for about 48 hours at room temperature. Cooking to the right softness appears to be a variable. Two methods of cooking pressure cooker or boiling water. I have equal success by gently boiling for 40 minutes or pressure cooking at about 35 minutes. The beans should have their shape and be soft enough to crush with the fingers. Meaning not too mushy. Yellow dehulled lentils were purchased from a bulk store. The purpose was to determine if they could be made into lentil tempeh. Lentils 500 ml were washed, and cooked at a gentle boil for about 30 minutes to make soft. They were cooled to ambient about 20C and starter was added about 1/2 teaspoon. The molds were used so I simply placed the beans in a plastic colander and placed in the top of the double boiler. I expected no positive results and promptly forgot them. After about 48 hours and in need of the double boiler and upon removing the lid found a perfect tempeh in the colander.A real case of serendipity. Then fermenting temperature was ambient about 20C. This is a perfect method to make tempeh without extra equipment and is a high quality product. 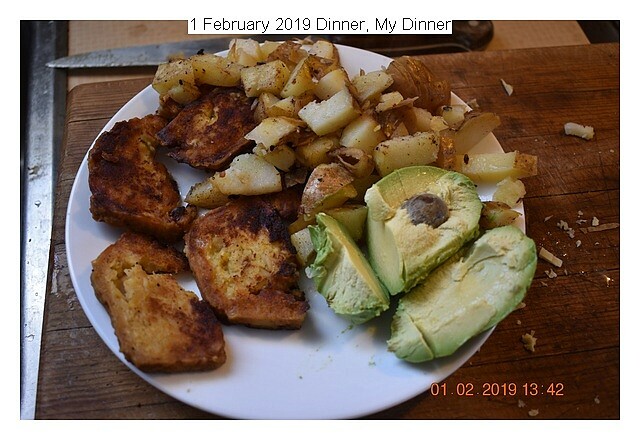 Simple meal fried tempeh lentil, fried baked potato, an avocado.